“iTunes is clunky, slow and complicated to use – a pain to use” says a web client who lost all his media files while backing up iTunes library. Is this case similar to what you are facing with iTunes? Then, be assured that there are ways through which you can back up your iTunes library to a USB without losing any file. Here are some of them! The small nature of USB Flash Drive makes it possible for iOS device users to conveniently back up their media files. Manually backing up ITunes library to USB Flash Drive makes it easy to move around with your media library. However, this process is not a straightforward one, you’ll have to first of all locate your iTunes library folder, then learn how to copy your library to flash drive. To locate where iTunes stored the media files you added to Windows or Mac PC, you will need to follow the appropriate path listed below. If the folder isn’t in the default location: Open Advanced tab from iTunes > iTunes Media Folder Location. This would show you where the media folder is located. Insert the flash drive into your PC’s USB port. Open the USB flash drive like a folder on your PC. Then, go back to the songs you would like to backup and highlight them. 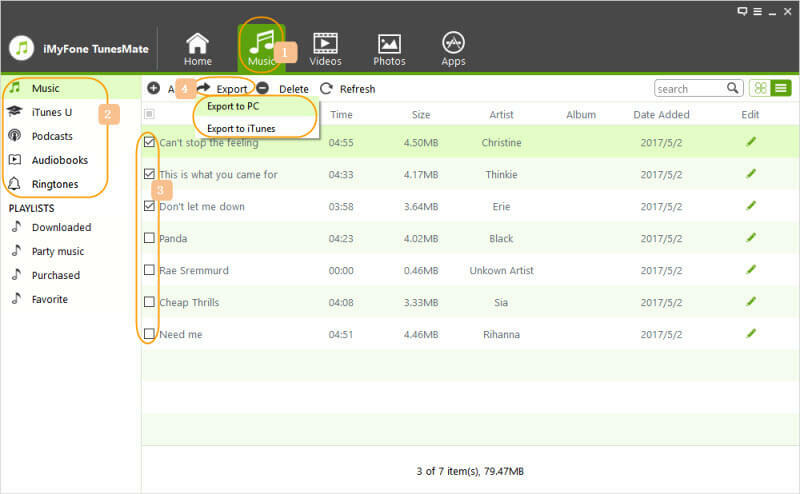 You can highlight a range of songs, individual songs or all songs in view. Drag the highlighted songs to the USB flash drive folder you’ve already opened. NOTE: This process can only copy songs in your iTunes library folder, but would not solve your iTunes issues. To learn better solutions for iTunes, proceed to part 2 of this article. There are several iPhone media transfer software which are good in file transfer between iPhone and computer. These third-party tools can be used to transfer videos, music, photos, and many other media and multimedia files. One of them; iMyFone TunesMate can be used to rebuild your damaged iTunes library. iMyFone TunesMate is a comprehensive and perfect alternative to iTunes. If you want the fastest and most efficient means of backing up iTunes library to USB flash drive, repairing your damaged iTunes library, and modify your library the way it will suit your needs, then get an iMyFone TunesMate today. This tool does not only transfer iTunes media library to USB, it can also be used for every iPhone media file transfer to any device, PC or location. It is the one-stop solution for all iTunes media file transfer and file management problems. iMyFone is reported by many well-known media every year! step 1: Download and install Tunesmate on your PC. Step 2: Connect your iPhone and USB to your PC, and run TunesMate on your PC. 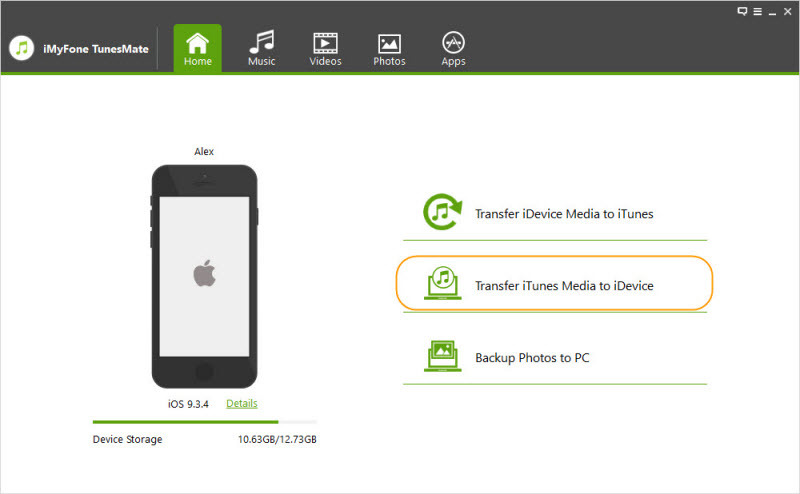 Step 3: Click on “Transfer iTunes media files to iDevices”. After finished, refresh the iPhone data in Tunesmate. Step 4: Go to any media tab that you want to backup, for example, the “Music” tab. Now, select the files to be exported and click: Export > Export to PC. Step 5: Locate a folder in your USB, click on “Select Folder” button, and the selected files will be exported to USB. Seamlessly sync iTunes library between iOS and USB - All it takes are few steps which have been listed in the next section. Rebuild damaged iTunes library - Is your iTunes library lagging, corrupt, can’t sync, losing files, or crashed? Then you can use iMyFone TunesMate to rebuild damaged iTunes library. Effectively manage iPhone media files - Is your iTunes not responding effectively? TunesMate can be a better alternative is for managing iOS files effectively. Flexible iOS transfer – Just drag and drop: You can transfer iOS files to PC/iTunes without any hitch. All it takes is to drag your files and drop them on your favorite library. It’s now 13 years since iTunes was introduced. Back in the days, Time Magazine called it “the coolest invention of 2003”. But with no upgrade and insensitivity to the needs of its users, iTunes is more or less inflicting the following three pains in the lives of its users. Slow, bloated and ugly: For over a decade now, Apple has been adding several features to iTunes. They never minded the needs of iOS users before adding such features such as Apple Music, Online Radio broadcasting, Music player, media store, media library, iOS management app, and much more. These have made iTunes slow, bloated and ugly, thereby waiting user’s time, and complicating its interface. Lacks support for many media file formats: If you want your iTunes to support file formats like AVI, MKV, FLAC, you must find a converter before you can add them to your media library. No export for iOS media files: It is still unfortunate that iTunes will still not let any user transfer iOS media files to other devices. But the good news is that as Apple is still silent on improving iTunes, many users are now downloading and installing iMyFone TunesMate – a third-party app, which is a perfect alternative to iTunes.